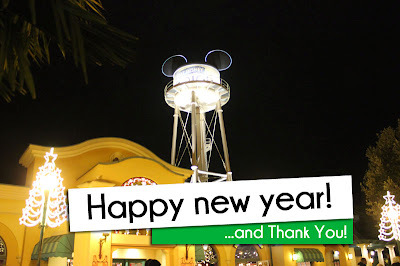 2013 has been a fascinating year for both Disneyland Paris (a review of the year article is to come very soon!) and DLP Town Square. One of the things that is so good about entering a new year is that it gives us a chance to reflect on the year that has just passed and to give thanks for it. And so, to everyone who has supported DLP Town Square since July 4th 2013, a massive Thank You. When I signed up for the twitter account, I really had no idea what I was getting myself into. Now, I have over 600 followers on Twitter, thousands of website views and a great deal of new friends. You’ve taken this ride with me, and I thank you for that. So what’s next with DLP Town Square? Well, since July I’ve been working on a new website for the blog. In a few days the migration will begin in earnest and I’ll be entering a private test phase. Hopefully, by the middle of the month the new site will be online. Until then, it’s business as usual. So once again, I wish you a Happy and Healthy New Year. – Thanks for all your support, it means a lot to me. PreviousPrevious post:L’Aventure Totalement Toquée de Rémy Press ReleaseNextNext post:2013: A year of pure Disney magic.